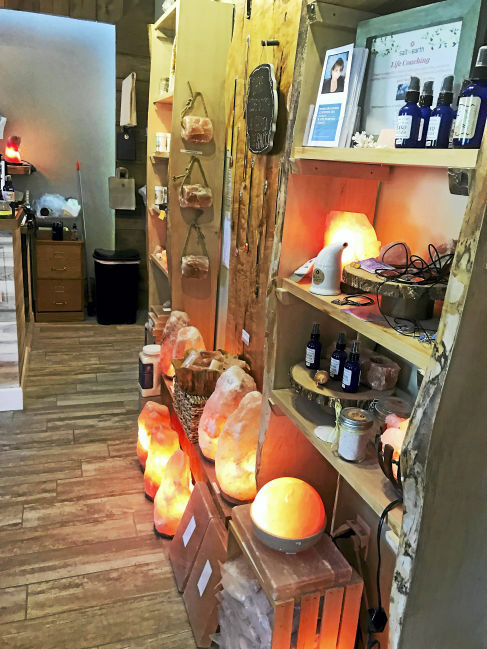 Woodbury >> Salt of the Earth Spa in Woodbury has come a long way since it opened its doors in late 2014 in the Woodbury Green South shopping center. Today, it has branched out into much more than a salt cave, it has become a healing way of life. “I had no idea what to expect from the way people were coming in here.Droves of people came in here, curious about the spa, asking ‘What is a salt cave?’ Then once they grasped the concept I started seeing more people come in here that had skin conditions and respiratory [issues],” said Sue Martovich, owner. Salt cave therapy offers an opportunity to not only relax, but a chance to get to the core of natural body recovery. It helps aid allergies, arthritis, asthma, bronchitis, Cystic Fibrosis, ear infections, eczema, migraines, hay fever, skin allergies, sleep disorders and more, Martovich said. Salt therapy, also known as halo therapy, is the use of an air-controlled environment in a natural salt cave microclimate. The salt is distributed through a salt generator, creating a negative ion climate to promote balance within the body and reduce stress. Halo therapy made its resurgence when a Polish health official, Dr. Felix Boczkowski, noticed the difference in the immune systems and health of salt miners, compared to other miners. His research was instrumental in the creation of salt sanitoriums located hundreds of feet below the surface of the earth. Since 2014, Martovich has seen more people coming to the spa with serious illnesses such as autoimmune diseases, cancer, and Lyme Disease. Martovich said this lead her to do more research and the more research she did, the more she realized there was more out there in the way of treatments, therapies and practitioners. “I think more or less it was like the change started happening a year in and we were getting a lot of people in that were on medication and had side effects from the medication and their bodies were [reacting] to the side effects,” said Martovich. Martovich said people were experiencing fatigue, joint pain, neuropathy, and anxiety, along with new allergies which they had never experienced before. “What I decided to do was build a network of people that we could call upon when I had somebody come in here that I can’t service,” said Martovich. For example, Salt of the Earth Spa offers a modality known as Chiren biophoton light therapy, which has been very popular among people who suffer from autoimmune disease and digestive disorders. “We recently got into energy work and energy work with Scalar, an energy enhancement system that was developed by Dr. Sandra Rose Michael based on Tesla technology,” said Martovich. Martovich said it has led them to learn about other types of treatments that she was unaware of until cients asked about the alternatives. Martovich said the treatments also helps people with sinus infections, so the salt bed is a popular alternative choice. One of the mantras for Salt of the Earth Spa since the beginning, is “take time to make time to relax,” since so many people today are victims of stress. People coming to Salt of the Earth Spa are learning how to let go. “When we are in stress mode, that is fight or flight, if you don’t relax, you’re not going to receive the full benefits of the treatment,” said Martovich. Martovich said through meditation, people can actually find the clarity they need, their coping mechanism improves, pain management improves and people are more grounded. Martovich said they are also introducing ayurvedic work, which is an ancient holistic healing system based on the belief that health and wellness depends on the delicate balance between body, mind and spirit. “We are starting ayurvedic facials with the Kansa wand and we will be selling the wands and ayurvedic oils,” said Martovich. Salt of the Earth Spa also offers a pain management meditation, that Woodbury resident Sonia Bodie said was a great class to take. Bodie said the meditation allows people to go into a place of awareness and expanded consciousness. “It’s a feeling of expansiveness, which is generally what meditation gives people.” The meditations, held by Cynthia Quintinal can be held in a group or one-on-one. Aside from the spa, Salt of the Earth has collaborated with Healing Arts Sanctuary LLC. The Sanctuary is a combination of a retail store that is highly focused on raising vibrations along with various services centered on healing, the arts, photography and much more. A major part of Sanctuary is centered on water. It looks at the integrity of water and teaches people about the natural power of water. “It really is amazing, once you start realizing what it feels like to be hydrated, it’s amazing,” said Kate Robards, an associate at the store. The retail shop also has healing jewelry, glassware and many other items. The Sanctuary will offer ayurvedic work, events and workshops. There is also a gathering space that can be used to host events for likeminded people for a fee. The Sanctuary will also have various programs for children. Martovich said she would like to teach children and teenagers how to meditate and how to tap into their creative side by writing a book. Martovich said they are hoping to become a center of learning and this expanded space allows them to take on new challenges. Salt of the Earth Spa is located at 787 Main St. South in Woodbury. For more information, call 203-586-1172 or visit www.naturalsalthealing.com. You may also like the Salt of the Earth on Facebook.